The perfect summer home situated in the perfect location! Immaculate lakefront property ''FOR SAIL''! One of the prettiest views available. Located on the ''in demand'' Greenacre Circle!Gorgeous great room with vaulted 2 story ceilings, floor to ceiling stone gas fireplace, cherry flooring and reading nook. Oak lodge style kitchen set up with all the major kitchen appliances. Behind kitchen you will find two guest bedrooms and full bath. One has its own private entrance. Entry level has a 20 x 13 owners suite with private bath. Lower W/O features a large family room with fireplace and adjoining recreation area, guest bedroom, laundry closet and 3rd full bath. 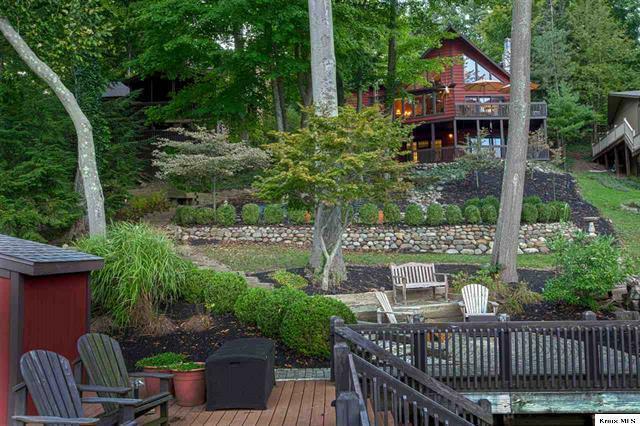 Beautiful landscaping, covered boat dock w/ boat hoist, jet ski hoist and huge sun deck. In a deep and wide cove.